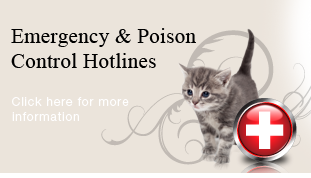 *If you think your pet has been poisoned, call an animal poison center help hotline right away! *If you think a person has been poisoned, call a human poison help hotline immediately! Locate the container with the label, follow the first aid instructions on the container if you can. Most products containing chemicals are labeled for identification. This information will be very helpful to the poison control centers. Pet Poison Helpline is a 24-hour service available throughout North America and the Caribbean for pet owners and veterinary professionals who require assistance with treating a potentially poisoned pet. They have the ability to help every pet, with all types of poisonings, 24 hours a day. Their knowledge and expertise will put your mind at ease when dealing with a potential emergency. There is a per incident consultation fee, payable by credit card. The Animal Poison Control Center is a resource for any animal poison-related emergency, 24 hours a day, and 365 days a year. Pet owners can call if they think that their pet may have ingested a potentially poisonous substance. Poison Control also assists veterinary professionals who request assistance with potential poisonings. The Upstate N.Y. Poison Control Center is a free human poison help hotline. If you think someone's been poisoned, follow the first aid instructions if you can. Then call your poison center right away! The Poison Help hotline at 1-800-222-1222 serves as a key medical information resource and helps reduce costly emergency room visits. The American Association of Poison Control Centers works to support the nation's 60 poison centers in the valuable work they do. America's poison centers are open 24 hours a day, seven days a week to help you. Their help is free and confidential. If your pet should become injured, or suddenly develop an acute, life threatening disease, it will need prompt emergency care! During regular office hours call (315) 682-0881, we are available to you and your pet for emergencies. Should you find yourself in the unfortunate position of needing medical assistance for your pet after-hours when our hospital is closed, call the Veterinary Medical Center (315) 446-7933. If you call our hospital's phone numbers after-hours, a recording will refer you to the Veterinary Medical Center (VMC). The VMC is the only veterinary facility in the Greater Syracuse area to meet the rigorous requirements of the Veterinary Emergency and Critical Care Society (VECCS) for a full-service Emergency and Critical Care Center. It is specifically operated, staffed and equipped to evaluate emergencies and provide the best level of care for critically ill patients. Veterinary Emergency and Critical Care Society (VECCS), along with the American Veterinary Medical Association (AVMA) and the New York State Office of the Professions State Board for Veterinary Medicine, provide guidelines regarding the delivery of Veterinary Emergency Service by these facilities. At least one licensed veterinarian must be on the premises during all hours of operation. Professional staff, including licensed technicians dedicated to patient care, assist to provide this emergency care. Caution is strongly advised and your pet is at risk when dealing with veterinary hospitals that advertise after-hour emergency care or 24 hour emergency care for patients but do not provide both a doctor and support healthcare staff at the facility during all hours of operation! There are also specially trained veterinary specialists in emergency and critical care available at some referral emergency facilities. They are board certified Diplomates of the American College of Veterinary Emergency and Critical Care (DACVECC). Any pet that is seriously ill, especially those that need close monitoring and life support measures in the intensive care unit (ICU) might benefit from the type of care a specialist can provide. The Veterinary Medical Center is an Emergency Hospital operated, staffed and equipped to provide emergency service. Most patients are treated on an outpatient basis. However, advanced capabilities enable the hospitalization and management of multiple critical patients. The VMC has recently expanded their veterinary emergency staff to include the only board certified Diplomate of the American College of Veterinary Emergency and Critical Care (DACVECC) veterinarian in the greater Syracuse area. The hospital is open 24 hours a day, every day, to see emergencies. Inpatients can be transferred to their primary care veterinarian the next workday or remain in the emergency hospital for continuation of care. A deposit will be required if your pet is staying at the hospital for evaluation or treatments. Payment is expected at the time services are provided. Cornell University Hospital for Animals is a full service veterinary emergency and referral hospital located at the College of Veterinary Medicine. They are primarily a teaching referral hospital with multiple board certified specialists, including Diplomates of the American College of Veterinary Emergency and Critical Care (DACVECC). Most patients are treated on an inpatient basis. Advanced diagnostic and treatment capabilities are available for critical patients. Before bringing your animal to the hospital, Cornell requests to please call for them prepare for your arrival and to give you special instructions. A deposit will be required if your pet is staying at the hospital for evaluation or treatments. Payment is expected at the time services are provided. Veterinary Specialists of Rochester and Animal Emergency Service is an Emergency Hospital operated, staffed and equipped to provide emergency service. They are also a referral hospital with multiple board certified specialists, including a Diplomate of the American College of Veterinary Emergency and Critical Care (DACVECC). Most patients are treated on an outpatient basis. Advanced diagnostic and treatment capabilities are available for hospitalized and critical patients. The hospital is open 24 hours a day, every day to see emergencies. Inpatients can be transferred to their primary care veterinarian the next workday or remain in the emergency hospital for continuation of care. A deposit will be required if your pet is staying at the hospital for evaluation or treatments. Payment is expected at the time services are provided.